Hello Frndzzz.... www.dealsnloot.com Back With New ShopClues Deal. 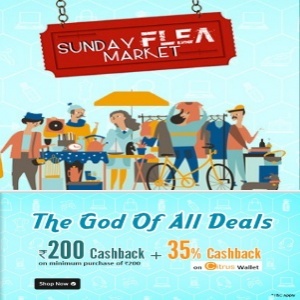 Shopclues Sunday Flea Market 13 September : ShopClues is back with Sunday Flea Market Sale. Use coupon from product page. Shopclues Sunday Flea Market is waiting for you and you are waiting fr him then why so much wait? Let’s goto offer page and start saving, Shopping at lowest rates/prices. Shopclues is now one of the top Seller of products for daily use. in Sunday flea market is offers products at more cheap/lowest rates/prices. The 200 off on 200 offer is valid only on products exclusive to the Sunday Flea Market sale between the time period starting from 5 PM Saturday, 12th September 2015 to 5PM Monday, 14th September 2015. This offer is redeemable in the form of Cluesbucks only. Instant cashback is not applicable for this product. Cluesbucks cannot be exchanged for cash. This offer is valid only on Prepaid Orders. COD orders are not eligible for this offer. Cluesbucks would be credited in the user’s registered Shopclues account. The maximum Cluesbucks credited to a user’s account is limited to 200, irrespective of the Sunday Flea Market cart value exceeding Rs 200/-. Get 35% CASHBACK up to Rs.75/- for shopping through mobile app or website of Shopclues and paying using Citrus Cash wallet. Go through the regular shopping flow on the mobile app or website of Shopclues. On the Payment Page, choose Cash Cards/Wallets => Citrus Cash and proceed to payment. Pay using Credit Card/ Debit Card/ Net Banking/Citrus Cash account.